(ANNANDALE-on-HUDSON, N.Y.) – Jazz pianist/composer Dan Tepfer and the International Contemporary Ensemble combine forces as Acoustic Informatics in a world premiere performance to kick off the Catskill Jazz series at the Fisher Center at Bard College on Friday, January 29, at 8pm, in the LUMA Theater. Joining Tepfer for this program are ICE musicians Joshua Rubin, clarinet; Rebekah Heller, bassoon; Alice Teyssier, flute; and Ryan Muncy, saxophone. Acclaimed jazz pianist Tepfer makes music at the intersection of jazz standards and avant-garde compositional practices. Joined by members of the International Contemporary Ensemble (ICE), described by the New York Times as “one of the most accomplished and adventurous groups in new music,” Tepfer will use the Yamaha Disklavier digital piano in combination with iPhones and iPads in an evening that explores the intersection of live musical improvisation and computer-driven algorithms through acoustic sound. 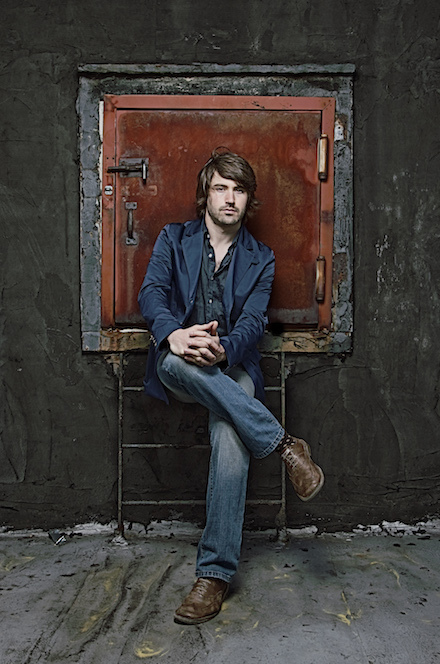 Born in Paris to American parents, “tremendously gifted” (LA Times) pianist-composer Dan Tepfer has translated his bicultural identity into an exploration of music that ignores stylistic bounds. His 2011 Goldberg Variations / Variations, which pairs his performance of Bach’s work with improvised variations of his own, has received broad praise as a “riveting, inspired, fresh musical exploration” (New York Times). He has worked with the leading lights in jazz, including extensively with saxophone luminary Lee Konitz, while releasing seven albums as a leader. As a composer, he is a recipient of the Charles Ives Fellowship from the American Academy of Arts and Letters for works including Concerto for Piano and Winds, premiered in the Prague Castle with himself on piano, and Solo Blues for Violin and Piano, premiered at Carnegie Hall. Bringing together his undergraduate studies in astrophysics with his passion for music, he is currently working on integrating computer-driven algorithms into his improvisational approach. Awards include first prize and audience prize at the Montreux Jazz Festival Solo Piano Competition, first prize at the East Coast Jazz Festival Competition, and the Cole Porter Fellowship from the American Pianists Association. His recent soundtrack for the independent feature Movement and Location was voted Best Original Score at the 2014 Brooklyn Film Festival. 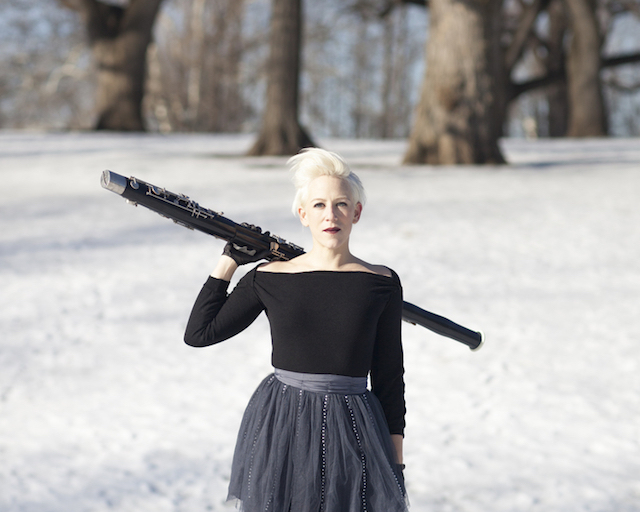 Praised for her “flair” and “deftly illuminated” performances by the New York Times, bassoonist Rebekah Heller is a uniquely dynamic chamber, orchestral and solo musician. Equally comfortable playing established classical works and the newest of new music, Rebekah is a fiercely passionate advocate for the bassoon. Called an “impressive solo bassoonist” by the New Yorker, she is tirelessly committed to collaborating with composers to expand the modern repertoire for the instrument. Her debut solo album of world premiere recordings, 100 names, has been called “pensive and potent” by the New York Times and was featured in the ArtsBeat Classical Playlist of the same publication. As a core member of the renowned International Contemporary Ensemble (ICE), Rebekah plays solo and chamber music all over the world. She has been a featured soloist with the Seattle Symphony Orchestra and the Nagoya Philharmonic and has performed in cities both near and far – including São Paolo, Rio, Manaus, Tokyo, Paris, Berlin, Köln, Salzburg, Chicago, New York, Boston, San Francisco, Minneapolis, and many, many more. A graduate of the Oberlin Conservatory, Heller lives in New York City. Flutist and lyric soprano Alice Teyssier brings “something new, something fresh, but also something uncommonly beautiful” (UT San Diego) to her performances. Hailed as possessing an “ethereal and riveting” (The Flute View) voice with “unusual depth” (Badische Zeitung), Alice’s mission is to share lesser-known masterpieces and develop a rich and vibrant repertoire that reflects our era. “An arresting soprano, in all senses” (LA Times), Alice has appeared as a soloist with the San Diego Symphony, International Contemporary Ensemble, Talea Ensemble, the San Francisco New Music Players, Oberlin Contemporary Music Ensemble, and the Bach Collegium San Diego (amongst others). She is a regular guest to the Monday Evening Concerts series, where she has premiered numerous works – from Salvatore Sciarrino to Cassandra Miller. In 2008, Alice was “haunting” in the United States premiere of Olga Neuwirth’s opera ‘Lost Highway’, after the David Lynch film, at Columbia University’s Miller Theater; she has since presented many modern operas by Viktor Ullman, Anthony Davis and Esteban Insinger, amongst others. A uniquely gifted advocate for new music, Alice seeks out conversations between composers, performers, students, specialists and listeners to develop unique and transcendent new experiences in concert music. To this end, she co-founded the music-image-movement troupe The Atelier with Michael Weyandt and Bradley Scott Rosen. She has given residencies for composers and performers of new music at such universities as Harvard, Leeds, Huddersfield and SUNY- Buffalo. Alice is very involved in ICE’s educational activities, and will be a pillar of the group’s residencies at Kent State University, Bard College and Macalester College this season. She has also been integral in the development of the new K-12 educational program EntICE, in which students perform newly commissioned works alongside members of ICE; composers Tania Leon and Marcos Balter are the 2015 EntICE commissionnees, composing works for ICE and the students of YOLA at HOLA and the People’s Music School of Chicago, respectively. Born in Australia of French parents, Alice has lived all around the United States, France and Germany and continues to perform on all continents. She has earned degrees from the Oberlin Conservatory of Music (BM, MM Opera Theater), the Conservatoire de Strasbourg (Specialization Diploma) and is currently in the dissertation phase of the Doctorate of Musical Arts at the University of California-San Diego, under the auspices of Susan Narucki. Praised for “superb” performances by The New York Times as well as his ability to “show off the instrument’s malleability and freakish extended range as well as its delicacy and refinement” by The Chicago Reader, Ryan Muncy is a saxophonist who performs, commissions, and presents new music. His work emphasizes collaborative relationships with composers and artists of his generation and aims to reimagine the way listeners experience the saxophone through contemporary music. He is a recipient of the Kranichstein Music Prize awarded at the 46th International Summer Courses for New Music Darmstadt, a Fulbright Fellowship in France, the Claire Rosen and Samuel Edes Foundation Prize for Emerging Artists, the Harriet Hale Woolley Fellowship of the Fondation des États-Unis Paris, and has participated in the creation of more than 125 new works for the instrument. His debut solo album Hot was released by New Focus Recordings to critical acclaim, praised as “absorbing” (Alex Ross) and “one of the year’s best albums” (Time Out New York). Muncy is the saxophonist of the International Contemporary Ensemble (ICE), a Chicago- and NYC-based organization dedicated to reshaping the way music is created and experienced. With a modular makeup of 33 members performing in forces ranging from soloists to large ensembles, ICE functions as performer, presenter, and educator, advancing the music of our time by developing innovative new works and new strategies for audience engagement—redefining concert music as it brings together new work and new listeners in the 21st century. During the 2015-16 season, the ensemble will present more than 135 concerts worldwide, including many which are free and open to the public, presented through the ensemble’s new initiative, OpenICE, which offers barrier-free experiences for diverse audiences. This unique performance is part of a larger residency project, in which Tepfer and the members of ICE will be presenting free community lectures at the Mountain Top Library in Tannersville. There will be a post performance question and answer session with the artists. Tickets are $25 and can be purchased individually, or a season subscription for all four spring Catskill Jazz programs at the Fisher Center is available for $95. For tickets and more information go to the Fisher Center at Bard College or call the box office at 845-758-7900. Acoustic Informatics is part of an outstanding line up of jazz concerts to be performed at the Fisher Center from January through April, curated and developed specifically for this special series. A season subscription for all four spring Catskill Jazz programs at the Fisher Center is available for $95. For tickets and more information go to the Fisher Center at Bard College or call the box office at 845-758-7900. Friday, February 12, at 8 p.m.
Five remarkable emerging jazz artists honor Billy Strayhorn, Duke Ellington’s most longstanding collaborator, striving to recreate “The Ellington Effect,” his unrivaled ability to combine his players’ distinctive tone color and set of emotions to produce a unique sound. Led by Walking Distance’s Caleb Curtis on saxophone, the evening features Marquis Hill, trumpet; Mike Fahie, trombone; Adam Coté, bass; and Jeremy Siskind, piano, in a concert straight out of jazz heaven. Saturday, March 19 at 8 p.m. Experience the secret past of improvisation from Bach to the Great American Songbook as classical pianist Tanya Gabrielian and jazz pianist Chris Pattishall join virtuoso André Mehmari on double piano in a musical journey spanning 300 years and layered with masterful improvisations. History’s best composers were expected to churn out improvisational masterpieces with regularity, so why are our associations with improvisation so deeply tied to jazz, yet so little to the classic musical past? In this special concert, three pianists recreate the rich and hidden history of improvisation with variations on works by Bach, Scarlatti, Schubert, and music from ragtime, Brazilian choro, and the Great American Songbook. Experience the irresistible grooves of South African jazz that inspired Paul Simon’s Graceland with UHADI, masters of Johannesburg’s jazz scene. Following their successful 2014 U.S. tour, UHADI comes to the Fisher Center for the final performance of their 2015 nationwide tour in a salute to Africa. UHADI is led by saxophonist McCoy Mrubata and features trumpeter Feya Faku, pianist Paul Hanmer, bassist Herbie Tsoaeli, and drummer Justin Badenhorst. In what promises to be a celebratory and joyful evening, UHADI will be joined by a host of special guests, including master Afro-Latin trombonist Chris Washburne, rising star South African vocalist Vuyo Sotashe, Zimbabwean mbira virtuoso Tanyaradzwa Tawengwa, blues guitarist Gary Wittner, saxophonist TK Blue, and vocal sensation Jazzmeia Horn, winner of the 2015 Thelonious Monk Institute Competition. A sister program of the 23Arts Initiative, the Catskill Jazz Factory is a nonprofit program founded in 2012 by Hudson Valley residents Piers and Lucy Playfair. A powerful new arts model, the program offers in-school workshops and concerts, artist residencies, and world-class performances throughout the Hudson Valley. Through this programming, the Catskill Jazz Factory supports some of today’s best young jazz artists with educational, creative, and performance opportunities at diverse venues across the region. By partnering with educational facilities, arts organizations, and a variety of local non-profits and businesses, the Catskill Jazz Factory encourages audiences of all ages to participate in community building through jazz.